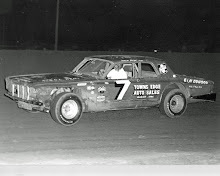 Johnny Rutherford behind the wheel of the Beatson Chevy. Schererville, Ind. 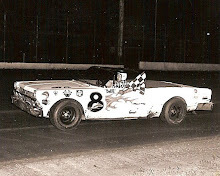 (May 13, 1962) – Johnny Rutherford of Fort Worth, Tex., driving the Beatson Chevrolet, scored his second consecutive major victory in 24 hours, when he swept the IMCA sprint car program at Illiana Motor Speedway before 5,000 speed fans. 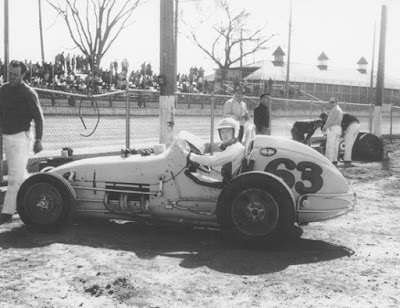 Rutherford, who qualified the Beatson car on the pole for the “Little 500” at Anderson, Ind., the night before, copped the second heat, match race and the 25-lap main event from a 36-car field attracted for the opening of the modern half-mile asphalt track owned by Harry Molenaar. 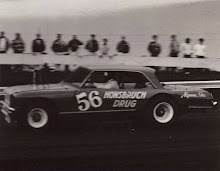 His time for the 25 laps, which will go as a new record, was 10 minutes and 27 seconds. Every heat race provided its own action as the veteran dirt track pilots accustomed themselves to the unorthodox grooves of the new flat asphalt track that was completed between rain storms two weeks ago. Though there were many near-accidents, only one driver, Harvey Konkel of Milwaukee, was sent to the hospital to be checked out after he crashed the Schmidt Special Into the outer guard rail during the consolation. 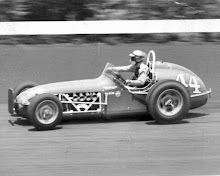 Arnie Knepper spun on the last lap of the feature. 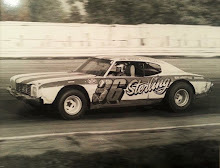 Visiting promoters and officials complimented owner Harry Molenaar and National Speedways, Inc., for the fine program and the snappy manner in which the events were run off.